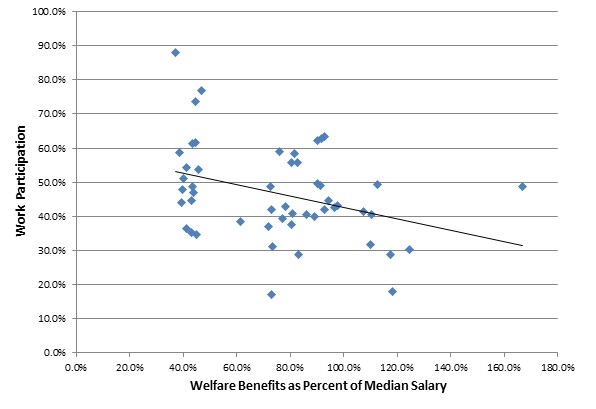 Does Welfare Reduce Work Participation? That’s quite a finding, but it doesn’t really hold up under scrutiny as Josh Barro explains. But that’s not what I want to talk about. I want to assume that those findings are correct and look at their outcome on work. Tanner and Hughes include a table in their report that lists every state and the percent of adults receiving Temporary Assistance for Needy Families (TANF) benefits who are in work activities. Work activities does not necessarily mean employed; it also includes job search activities as well. So, to see if welfare disincentives people to work, we can look at which states have the highest work participation and compare that to the welfare packages they offer, right? After all, if states with substantial welfare packages also have low work participation rates, that’s a sign that welfare may act as a disincentive. But looking at the benefit levels themselves isn’t helpful. What matters more is the purchasing power of those packages. That’s what people really care about. Five hundred dollars in SNAP (food stamps) benefits will buy you a lot more in Fargo, North Dakota than in New York City and that impacts people’s desire to work. I couldn’t find a measurement of the differences in cost-of-living in different states – possibly because it varies so much within states themselves – but Tanner and Hughes actually provide a metric that can be used as a proxy for cost-of-living: median salary. 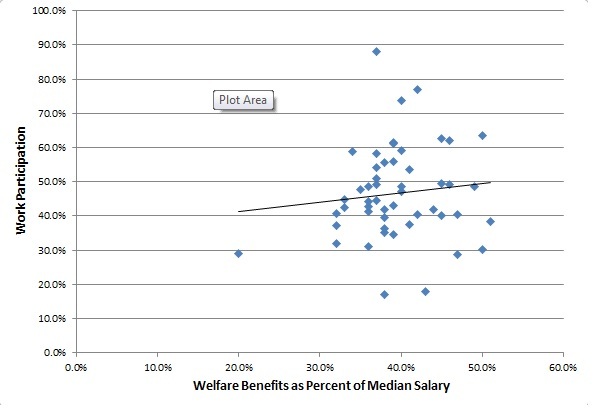 In fact, they present welfare benefits as a percent of the median salary for each state. Median salary is not a perfect proxy, but it is still a pretty good measure of the cost-of-living in each state. There’s certainly a negative correlation between welfare purchasing power and work participation, but it’s not that strong. In particular Idaho’s work participation rate of 87.9% along with its small welfare purchasing power (36.9% of median salary) is impressive. But this analysis isn’t quite right. You may be looking at the welfare benefits as a percent of median salary and are shocked to see so many percentage over 100 percent. That’s because just about no one actually qualifies for all eight of the welfare programs that the Cato Institute includes. As Barro points out in his article, most people on welfare receive SNAP and Medicaid benefits and nothing else. The correlation is positive now! State’s with greater welfare purchasing power have higher work participation rates. The correlation is even less than in the previous graph so it’s not particularly meaningful. In addition, correlation does not equal causation. This could be a complete coincidence. But it should at least make you pause whenever you hear conservative claims that welfare causes people to forego their job search and mooch off other taxpayers. The evidence on it is very unclear.